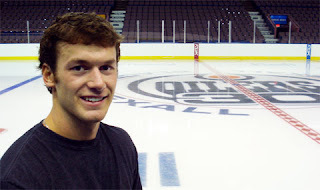 A photo of Edmonton Oilers rookie Taylor Chorney on the team's official web site reveals the new paint job on the ice at Rexall Place. It's the traditional Oilers logo with a giant "30" at the bottom. You can go to their site or see the image below. By the way, I said "traditional" because you'll notice the distinct lack of a red circle encompassing the logo. It's what I anticipate seeing on this season's third jersey. Thanks to Darren for the tip on the photo. I imagine that or something similar will serve as a special patch somewhere on the Oilers' jerseys this season.